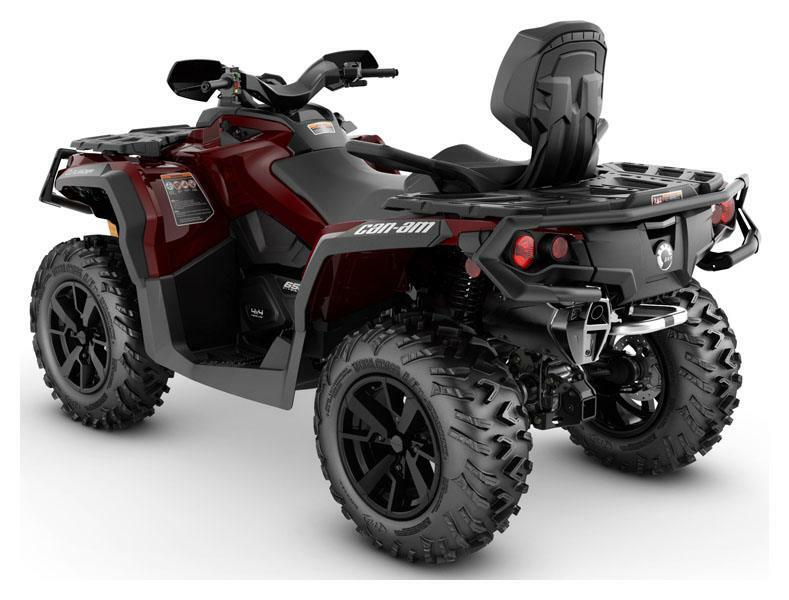 Built for unmatched off-road performance—with a passenger—the new 2019 Outlander MAX XT boasts wider, revised suspension to make the most of legendary Rotax power and now tows up to 1,650 lb. (750 kg). ROTAX V-TWIN ENGINE: Available with the 78-hp Rotax 850 V-Twin engine, the Outlander puts all that torque to the ground with responsive throttle, a signature roar, and power to spare. Renowned for flexible reliability in harsh conditions and easy maintenance, Rotax engines have seen every corner of the world—and that's not a boast. TRI-MODE DYNAMIC POWER STEERING (DPS): Feel off-road terrain like never before with Tri-Mode Dynamic Power Steering (DPS), which gives easy steering assistance and adapts its response to the vehicle's speed. At lower speeds, assistance is increased to reduce your steering effort while at higher speeds it's reduced to return maximum feel to the rider. Choose between three modes to match the conditions. FULLY REVISED FRONT AND REAR SUSPENSIONS: The most significant Outlander upgrade yet, it's all about taking the ride even farther. Starting with front arched A-arms, sway bar, and revised wheels for a wider stance and more confident handling. The independent rear suspension eliminates scrub and camber changes for unparalleled vertical wheel control—rather than in a flexive butterfly motion. Rotax power with leading traction and power transfer. 3,000 LB. WARN WINCH WITH ROLLER FAIRLEAD: This powerful winch with a 3,000 lb (1,361 kg) capacity is factory installed and can handle the toughest situations, an indespensible tool when tackling conditions that include hunting, ranching, mud holes—and helping your friends keep up. ERGONOMIC PASSENGER COMFORT: Like everything else on the Outlander, the MAX seat is engineered for a reason, with ergonomic multiposition handgrips and raised floorboards to ensure more comfort on long rides—or flip the passenger seat down in seconds and gain even more cargo capacity. CONTINUOUSLY VARIABLE TRANSMISSION (CVT): Rugged Continuously Variable Transmission (CVT) technology gives you shiftless, responsive gearing at the right time. For ease of use, you can count on the engine braking feature to help slow you down when going downhill. SURROUNDING SPAR TECHNOLOGY (SST) FRAME: Quality shines in everything we do—and the foundation is the next-generation, industry-exclusive SST frame with Geometric Contact Control. The efficient welded-steel frame incorporates advanced manufacturing processes and geometry for increased structural integrity, improved durability, and precise handling. 26-IN. ITP TERRACROSS TIRES AND 14-IN. CAST ALUMINUM WHEELS: Performing as well as they look, 14-in (35.6 cm) cast-aluminum wheels with less unsprung weight and improved strength are matched with durable 26-in (66 cm), 6-ply ITP Terracross tires with a tread that delivers both a comfortable ride and strong off-road grip. DURABLE COLOR AND CAMOUFLAGE OPTIONS: Even the finish is, well, finished: a high-grade, durable painted plastic that gives the Outlander the looks and the ability to brush off wear and tear. Our method of production also ensures plastics retains their finish and stay scratch resistant. Optional premium water-dipped Mossy Oak Break-Up Country camouflage looks as good as it performs, as you'd expect. HARDWORKING STANDARD FEATURES: An industry-leading 1,650-lb (750 kg) towing capacity, front and rear racks with LinQ attachments points, and multifunction gauges will make the Outlander your preferred companion for work and play.